If ever ‘Brothers Quay’, ‘David Lynch‘ and ‘Guy Maddin‘ decide to make an animation film, certainly it would look like ‘The Wolf House.’ The surrealism, eeriness & meticulous sound design in the films of Lynch and Guy Maddin’s eccentricity and sad spirit of lost films are finely woven on with the Lewis Carrol’s ‘Alice in Wonderland trouble-land (Colonia Dignidad)’ that results in the disturbing phantasmagoric narrative that pushes the boundary of conventional cinema. 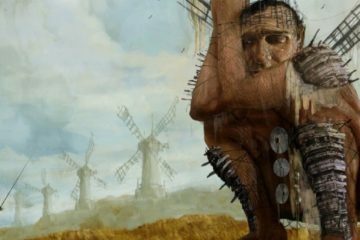 It is not only the most inventive & imaginative animated film of the century but it re-writes the narrative grammar for animation based on ‘Manichaeism subjectivity’ that often alternates between beautiful and grotesque, horror and hope. 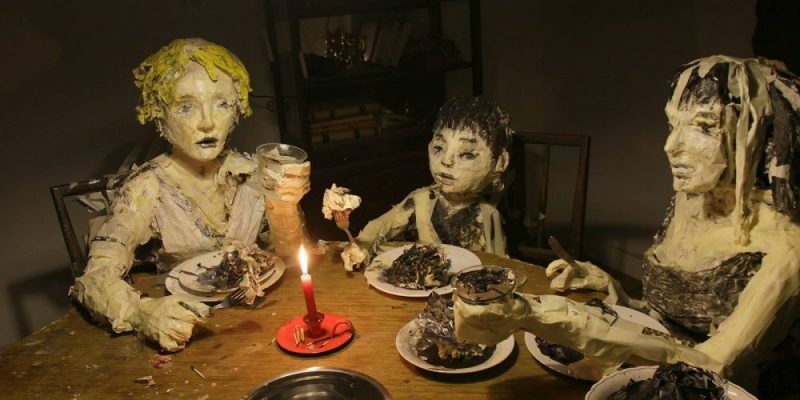 The entire space including the characters develops from paints, papier mâché, sculpture and paintings that undergo metamorphosis to reshape itself as if the objects have gained consciousness, and fall apart – like a cellular being coming alive in a house embodying Kafka, soon to disintegrate and extinct as if it never existed. A debut feature film from the duo of Chilean filmmakers Joaquín Cociña and Cristóbal León, The Wolf House [La Casa Lobo] is a dense and mysterious psychological drama that stitches the real-life ‘Colonia Dignidad’ terrorising inhuman acts with fables like ‘The Three Little Pigs’, ‘Red Riding Hood’ and ‘Snow White’. The strong political connotation is subtly chipped in the plot after the flashy German propaganda prologue. It tells an allegorical story of María, a girl, fond of playing with animals instead of working in the farm, is sentenced to a punishment of not speaking to anyone for hundred days. She runs away to seek refuge in a house from people of the community and a wolf hot on her heels. The abandoned place doomed for decay becomes hideout place for her where she finds three pigs. Maria raises them as her children. The house comes alive – tables fold on itself, followed by floor swallowing it; candles start flickering; chairs start dancing; paintings come alive; the room falls onto itself and turns into a flat sheet. Maria breaks like broken glass, falls apart in the horror of the voice, and gradually ruined surrounding swallow her; but she grows out of the 2D figure on the wall into a living and breathing figure. At the centre of the surrealist narration lies the terrorising act of a fundamentalist Germans in the colony often called the Chileans “Schweine”, which meant pig. The film opens with a sweeping German propaganda that takes pride in their former colony and reclusiveness from the outside world, as put by the narrator, “ closed off from the temptations of the outside world.” A German cult figure, Paul Schafer, who fled his country to escape charges of paedophilia is often heard calling Maria to come out from the hiding. It signifies more than what meets the eyes here. Every saccharine calling of an unknown voice in the house – which presumably belongs to Paul – coupled with the belief of Maria that she could control her surrounding for her advantage, results in the drastic displacement of space and distortion of the figure, conveying the struggle between the two extreme forces. Juxtaposing the fables with the horror of life in the colony, it is just an extension of a child asserting her independence against the cruelty outside the house. At the end, when The Colony’s official voice returns and the propaganda film’s presumed director addresses us directly, we are forcefully thrust back into the Orwellian world.